In the cold, winter weather, a nice, warm soup can really hit the spot. Especially if said soup is full of cheesy goodness! First, let’s gather our ingredients. 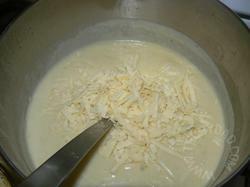 For the record, that’s 2 sticks of butter, 1 cup of flour, 6 cups of milk, 3 cups of chicken broth (or, as I used, No-Chicken Broth), 3 to 4 cups of shredded chedder cheese, two packages of frozen broccoli and salt and pepper (to taste). 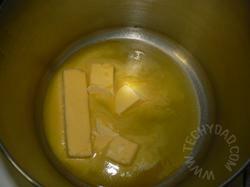 Now toss the butter into a nice, big pot on medium heat and let it melt. 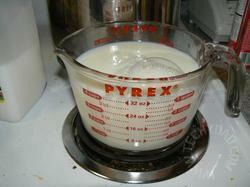 Once the butter is melted, mix in the flour and cook this for awhile. Make sure you keep stirring. 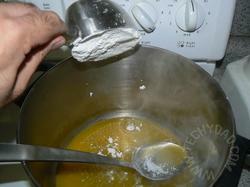 I’ve found that stopping stirring lets the flour/butter mixture (aka the rue) settle to the bottom of the pot. 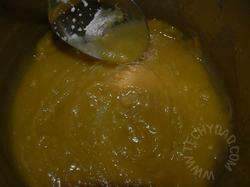 The resulting soup will be much more watery and you’ll have more bottom-of-pot gunk to clean up. Neither of these outcomes is very desireable. You can also add in your pepper now. 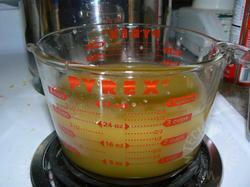 It will seem like you’re stirring forever, but eventually the soup-to-be will start to bubble. 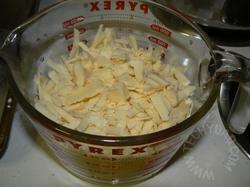 Once it does, add in your shredded chedder cheese. Resist the urge to nibble on some….. Ok, maybe just one bite. YUM! 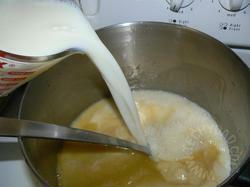 Keep stirring until the cheese melts. This won’t take long. 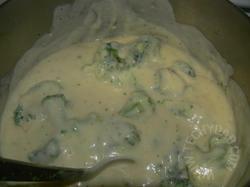 Once it has melted, toss in the frozen broccoli florets. 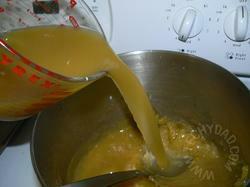 Keep stirring the soup until the florets cook. This shouldn’t take too long at all. Now simply ladle into bowls and serve. With crackers, if desired. 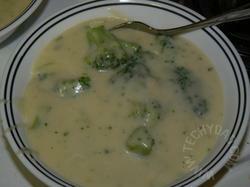 By the way, there’s a variation that we’ve done, which we actually like better than Broccoli Cheddar Soup. 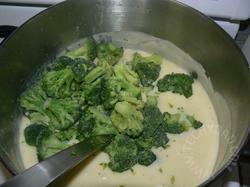 Use cauliflower florets instead of broccoli florets. 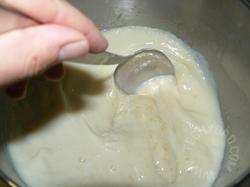 Then, when the florets have cooked in the soup, use an immersion blender to puree some (not all) of the florets. The cauliflower’s taste blends (no pun intended) into the overall soup better and the pureed cauliflower is easier to sneak by fussy palates of kids. Either way, this soup is full of cheesy goodness. Credit where credit is due: This recipe was sent to me by kileigh7. 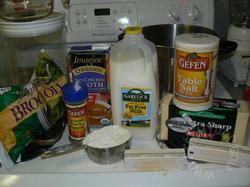 Also important to note that you typically make this soup with reduced fat cheese. The one in your photo is not the usual ingredient. Tastes just as good while being more calorie friendly.